An architectural landmark in the heart of downtown Toronto, 8 Elm Street Condos offers strategic and scenic commercial offices, retail space, and apartments. It is steps from Dundas subway station, walking distance to the University of Toronto, Ryerson university, very close to the 5 major hospitals and parks (Larry Sefton Park, College Park and Joseph Sheard Parkette). Every unit comes with individual bicycle parking spot. 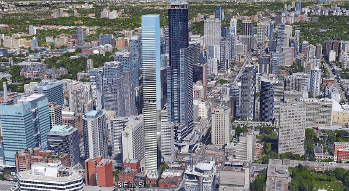 The 8 Elm Street Condos - 80-storey residential tower with 469 residential suites, along with 7,696 m² of commercial floor area. The Tower was designed by Page + Steele IBI Group and developing by Pemberton Group who focus on making your home buying experience better than you ever imagined. 8 Elm Street Condos designed by Page + Steele located in The Bay Street Corridor Neighbourhoods that known for a high number of people who walk to work, cyclists, health workers, renters and university grades. This new tower will be located in the middle of Toronto’s cultural, scientific, educational and political spheres. Many young professionals live in this neighbourhood, attracted by being at ground zero for law firms, investment banks and Canada’s economic movers and shakers.